Left and Write: W: The Whizzer! Yeah, yeah...laugh if you want, but it's still better than "Elongated Man"...right? Anyway....The Whizzer...aka Robert Frank...debuted in USA Comics #1 (August, 1941), published by the precursor to Marvel Comics, Timely Comics. Created by artist Al Avison, rumor has it that Stan Lee, himself, was the writer who came up with the character, but that has never been confirmed. 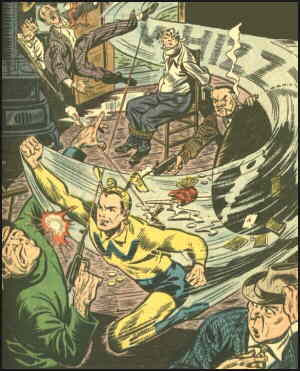 The Whizzer was featured in solo stories for the first half of the 1940s then, in 1946, was made part of The All Winner's Squad. Now onto The Whizzer's origin. You'll probably be glad to note that he was not a scientist and radiation also wasn't involved in Frank getting his powers. No, he got his powers from being bitten by a cobra while on a trip with his father (who was a scientist). Well, he didn't get his powers from the cobra bite itself, but from the transfusion of mongoose blood his father gave him to try to save his life. Mongoose blood to combat cobra venom.....makes sense, right? What? You've never seen Riki Tiki Tavi?? Later on, in the 70s, his origin was amended (retconned) a bit to say that the mongoose blood triggered his latent mutant abilities, which accounted for his super speed. Personally, I think the straight mongoose blood is a more fun origin tale. I can't believe, with War Machine as an option, that you went with the Whizzer. He was one of those kids that got picked on for his name. And, no, it's not better than Elongated Man. Oh my. Mongoose blood. You were right when you told me that there have been weirder origins than chemicals or radiation! Mongoose are all around Jamaica. I've heard the name but never knew Whizzer's story. Thanks for sharing and a son huh? Somehow I don't think he grew up to be a social worker. Now I'm wondering who their son is. Hopefully, Miss America helped choose his name! He got around a bit between those superhero teams. He was very fast, so that explains it! Mongoose blood - that is original. 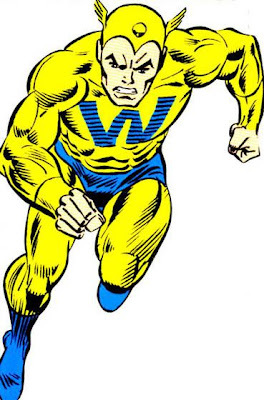 When I hear Whizzer though, I don't think of speed. Noooo! The Whizzer? Come on. 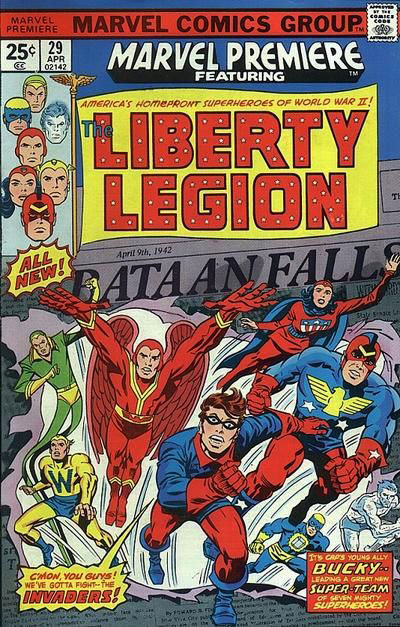 I think it's a tie for worst super hero name ever with Elongated Man. Sorry, someone like me is just too immature to read either of their names without laughing like Beavis and Butthead. Huh huh, he said, "Whizzer." Nice to hear he settled down and got married. And I loved Riki Tiki Tavi. A bit of an unfortunate name, but the mongoose story is different. My only exposure to him was on the 90's Spider-Man cartoon. Even Spidey was dubious about ol' Whizzer's name. i am still snickering... if only i could stop... first great laugh of the day. he needs a theme song. Still laughing, and then I read the other comments, and I laughed even more. Poor guy. Well, you know that name tickled me so much I immediately felt that this day was off to a happier start than expected. Really? I know you said we could laugh at the name "The Whizzer" but I can't help but be confused. What kind of connotation did "Whizzer" have when he was created to make him socially acceptable? haha. I did laugh inside. I admit. I'm not sure which was worse for this poor fellow - his name or the mongoose blood origin. Oy. Yeah, I like the Mongoose Blood one. Whizzer is something like the Flash, right? So Miss America had a baby. There goes her figure!!!! The Whizzer? Honestly, I think it's worse than Elongated man. LOL yeah, this is a really unfortunate name. I think it might be worse than Elongated Man. Poor Whizzer. Now I think this one takes the cake on a name. I mean really? The Whizzer? I remember you writing about him earlier on and thought it a silly name! At least he was a do-gooder and had a happy home life... Nowadays super heroes can't be happy for any length of time. I wish they didn't always have to follow that story line. Gets old after awhile. WOW... what an interesting name!! The Whizzer and Miss America... that is awesome. I love a Romance. Now I want to know who their kid is and how he/she turned out. I can't believe this challenge is going to end and I am just going to be In The Dark. Huh. I like your version of the mongoose blood instilling super powers. @Susan: I agree...even for back then, it was pretty original. @Tyrean: Heh, yeah it might have been his only bragging point..."Yeah, make fun of my name, will ya...I don't care..I married Miss America!" @Capillary: I think, back then, it just meant 'something fast'...as in, "he just whizzed by"...I'm guessing. @mshatch: Now that'd be a team up I'd like to see! You're certainly correct when you say you have to watch out for him. Especially any sudden spins he makes. @Andrew: LOL...very true...especially if you don't have an umbrella handy! 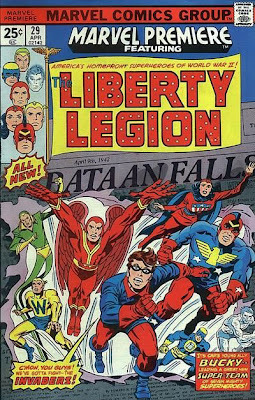 I really don't know a lot about present comic book super heroes, never mind classic ones! Cool info! Whizzer and in yellow too, sorry that's just funny! Really enjoy learning about all these super heroes. Hi Mark - well Whizzer adds another dimension to Kipling's Riki Tiki Tavi .. a transfusion of Mongoose blood to make you faster - I think I need some of that ..